On the cusp of victory, at match-point with the score at 20-19 in her favour in the deciding game, after a struggle lasting well over an hour, defending champion and top seed, PV Sindhu, faltered with an attempted net dribble that hesitated at the tape and fell back on her side. That narrow let-off was sufficient for Chinese-born American, Zhang Beiwen, to grab the final three points of the thrilling summit clash of the India Open World Tour badminton championships, and register her first major international title and a winner’s cheque of $26,250, with a 21-18, 11-21, 22-20 triumph. The reverse was yet another in an ever-lengthening list of desperately close defeats that had begun 17 months ago with a heartbreaking three-game loss to Spain’s Carolina Marin in the Rio Olympics, gone on to an even closer vanquishment at the hands of Japan’s Nozomi Okuhara in the 2017 World Championship final in Glasgow, and then to a conquest by another Japanese, Akane Yamaguchi, by a wafer-thin margin in the year-ending Superseries Finals in Dubai in December last year. One can add to this list the November 2017 Nationals final in Nagpur, in which Sindhu went down to fellow-countrywoman and Gopichand Academy sparring partner, Saina Nehwal, at 17-21, 25-27, in what had been billed as a contest to decide who was India’s best female shuttler at the moment. The statistics show the younger woman winning just two of the eight finals she has reached since her silver-winning feat at the Rio Olympics. It could be said, without fear of it becoming a point of debate, that the Sindhu we saw in the finals at the Siri Fort Indoor Stadium was not the player who had employed optimal doses of speed, power and aggression the previous day to administer a 21-13, 21-15 shellacking to former world champion, Ratchanok Intanon of Thailand. There was a wide chasm between the body language of the two protagonists in Sunday’s final, with Zhang maintaining a poker face for the greater part of the contest, while Sindhu’s visage wore a perennially worried frown that bespoke inner turmoil. Sunday’s Sindhu seemed nervy and uneasy throughout the match, as if she were bowed down by the pressure of being the defending champion at the India Open. Instead of taking her win last year as a psychological advantage, she seemed to treat it as a cross she had to bear. She also appeared to lack the finer edge in physical fitness that was needed to subdue the American, ranked No 11 on the Badminton World Federation (BWF) computer. Indeed, one lost count of the number of times that the Indian was pulled up by the chair umpire for time-wasting. Technically speaking, the match was won and lost at the net, where the American displayed outstanding skills in using the dribble and counter-dribble, to have her rival constantly back-pedaling and clearing the bird only to midcourt, for the former to finish off the rallies comfortably. The 27-year-old Zhang also used minimal power on her smashes, preferring to use direction and angle, and conserve her energy. Another area in which Zhang scored over Sindhu was in giving her Indian opponent scant opportunity to employ her powerful smashes. The American was rarely guilty of clearing the shuttle to the midcourt region, and she was quite comfortable defending when Sindhu was forced to smash from a position closer to the baseline. Zhang also used her physical resources wisely, ensuring that she took the opening game by cutting out unforced errors after the two were locked at 15-all, and again when Sindhu reduced the margin to 18-19. Pocketing the first game allowed Zhang the luxury of not extending herself after her antagonist took big 8-2 and 11-4 leads in the second. 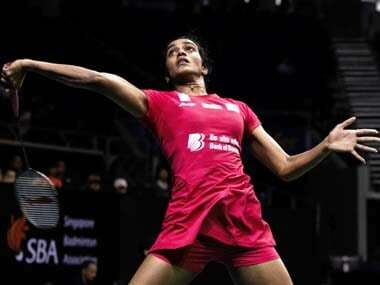 Sindhu, on the other hand, had to put everything she had into the second game, only to restore parity. That big effort told on her in the decider, as she appeared to run out of steam at crucial junctures and resorted to time-wasting that could easily have earned her an official warning and/or a yellow card. Despite all these flaws in her showing, Sindhu was good enough to stage a strong fightback, to come back from 17-19 to match-point with a three-point reel. That botched net dribble cost her the winning point, and Zhang showed far the stronger nerves to close out the edge-of-the-seat contest. Coach Pullela Gopichand has repeatedly said in recent times that he considers Sindhu to still be an unfinished product. Be that as it may, there can be no two opinions that the 22-year-old requires psychological counseling, so that she can get over her end-game blues which are only piling up as she makes her way through final after tournament final. Sindhu needs to watch a tape of her India Open clash against Zhang Beiwen, as also of her 2017 world championship final against Japan’s Nozomi Okuhara, to appreciate the importance of body language during the closing reaches of a key encounter. To reveal your exhaustion and inner turmoil to an opponent at that crucial juncture is akin to waving a red cloth before a bull. On the other hand, putting on a poker face as you face your opponent for the next point, despite struggling with oxygen-starved lungs and leaden feet, is to lower morale on the other side of the net. The sooner Sindhu realises this, the faster her results in hotly contested finals will improve.